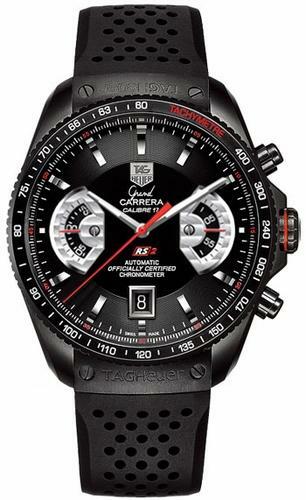 This Grand Carrera watch from Tag Heuer brings race car style chronographs to your wrist in an agreeable black and red design. The chronographs are automatic while the watch dial is an analog, and there is a date aperture at the 6 o’clock mark. This watch is designed for optimum readability. The hands and hour markers are silver, faceted and hand applied. They are also coated with luminescent material so your watch is easy to read in the dark. The crystal face is made of premium sapphire crystal, the strongest and most scratch-resistant type of crystal used in watches. Sapphire crystal is stronger than the other leading types of crystal and can only be scratched by a diamond. It is double coated with anti-reflective treatment so your watch will not create a glare. The timepiece is also certified by the official Swiss Office of Chronometry for its C.O.S.C. chronometer. The C.O.S.C. chronometer movement is engraved with a unique number and comes with a booklet and card from Tag Heuer. Certification from the Swiss Office of Chronometry is one of the highest achievements for chronograph movements in the watchmaking industry and ensures an extremely precise and quality instrument. While the dial displays hour, minute and second hands the chronographs give simple and additional time measurements. These displays are ideal for measuring races but can be used during other sporting events as well. The bezel also provides a tachymeter scale which many other watches lack. The tachymeter scale is used to determine the speed of a car or object by measuring the amount of time it takes to cover a specific distance, such as a meter or a mile. The movement contains 37 rubies to aid in accuracy and extend the life expectancy of the watch. It features rapid date correction, and runs on vibrations which strike 28,800 times per hour. However, if the watch is not worn for 42 hours it will begin to lose power and wind down. The case and bezel are made of grade two titanium and coated with titanium carbide, while the strap is made of black openwork rubber. It has a safety push button on the strap and is designed to fit your wrist snug and comfortably. Although automatic watches will wind down if they are not worn, you will find that the quality of the watch’s movement compensates for any maintenance. This watch is a masterwork with numerous assets not only for race car drivers and enthusiasts, but for those who love watches as well!